What makes some mountaineers eschew the headline peaks and instead head into little-traveled rugged landscapes, suffer through days of bushwhacking, hard-to-find trails, bad weather, and difficult rock climbs, all to bag a mere 8000' peak that few have ever heard of? We here at TinyMtn headquarters near Boston frankly have no idea. But these brave souls keep going back, and they go to places like the Picket Range in Washington. The Picket Range is the most rugged set of peaks in the already-rugged North Cascades National Park in Northwest Washington. Picket's backwoods feel, lack of major trails, spectacular scenery, and steep pinnacles make it a near-private nirvana for whomever has the grit to go there to witness its miracles in person. First mapped in the 1920s, most of the highest peaks in the range were not summited until the 1930s. Since then, the Pickets has been a haven for lovers of remote, backcountry rock climbing. The photos they bring back are a rare treat for armchair alpinists like, well, me. 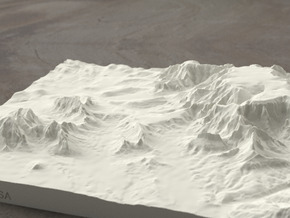 In the Southwest corner of our 3D model of the Picket Range is Jasper Pass, and looking East we find Goodell Creek, the Crescent Creek Spires, then Mts. Terror and Degenhardt and The Barrier. Continuing past The Pyramid and Inspiration Peak are the McMillan Spires, and ultimately Azure Lake in the Southeast corner of the model. Crossing Picket Pass to the Northern Pickets, we show Outrigger Peak, Mt. Fury, and the ridge extending Northeast to Luna Peak, the highest in the range at 8315' (NAVD88). Northwest along the range are Phantom Peak, Crooked Thumb Peak, and Mt. Challenger, with its large north-facing glacier and most popular climbing route. 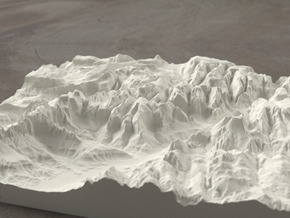 The Northwest corner of the model includes Whatcom Peak and portions of Easy Ridge, while the Northeast corner contains a portion of Luna Creek just below Beaver Pass. Click here for other 20" models. 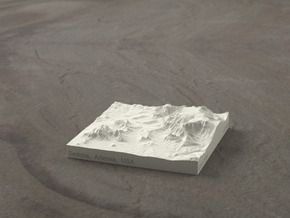 TinyMtn models are most affordable in the "White Strong and Flexible" and "Sandstone" materials. 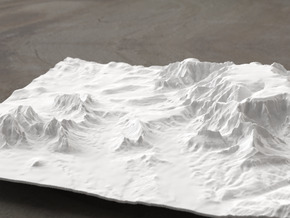 This model is in "White Strong and Flexible." When you receive the model, there may still be Nylon dust on it from the printing process. Use either an airbrush, canned dust blower, or a soft old toothbrush to remove this dust. Do not get the "White Strong and Flexible" material wet, and don't prime it or use any oil-based paints on it. You can safely seal it with Polycrylic or a similar water-based clear spray sealant. Read more about this popular material here. The "Frosted Detail" material will show more detail, but is semi-transparent and has an uneven surface texture when unpainted (due to the orientation of the model when Shapeways prints it). It may show up feeling a little greasy and with small crystals in crevasses. Clean those off by soaking the model in warm (but not hot) soapy water and brushing with an old toothbrush. To get the surface to an even matte finish, spray with a few light coats of sandable primer (white automotive primer works), and then do a baking soda grit-blast.